The Poinsettia has played a starring role in Christmas celebrations. 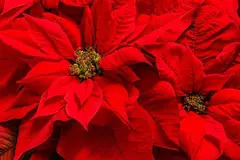 Poinsettia is a snap to grow and will look great for months long after the holidays are over. Use large ones to flank a doorway and smaller specimens as hostess gifts or place settings. In frost-free areas, poinsettias are often used as landscape plants to provide a big shot of festive color during the season. Care Instructions Poinsettias thrive on sunlight. 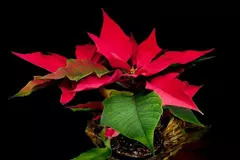 If possible place your poinsettia near a sunny window away from heat ducts or fireplaces. Water whenever the soil feels dry to the touch. After the flowers (technically the bracts form the colorful petals, the yellow centers are the true flowers) fade you can toss the entire plant or keep the plant as a houseplant. Simply prune the plants back to a height of 6 to 8 inches and eventually you will see vigorous new growth. You can move the plants outdoors after frost danger. Feed your plants once a month with a liquid houseplant fertilizer. Outdoors as an annual, poinsettias thrive in sunny spots and moist, but well-drained soil. 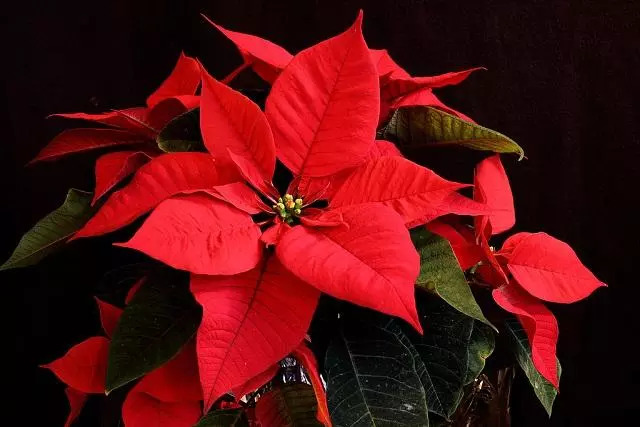 Poinsettias are not poisonous, but we do not recommend them for human or animal consumption.